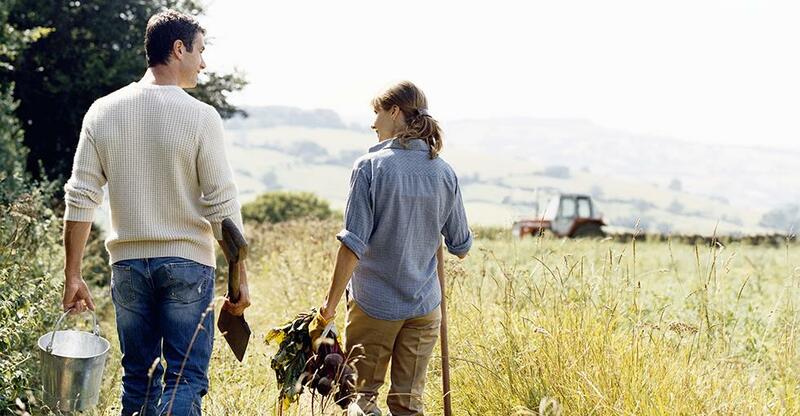 More and more young people are making the move from desks to tractors. The increase of young farmers getting into the industry is still too new and too small to have turned up significantly in statistics, but the farming world is acknowledging this trend. So is the government. In fact, young farmers came out the clear winners with the 2014 farm bill. Last April, the USDA announced $19 million in grants to those trying to break into farming and those who have been in the business for 10 years or less. The grants, managed by the National Institutes of Food and Agriculture, are an attempt to address the issue of America’s aging agricultural work force. Modern Farmer reports the average farm operator age was over 58 years old in 2012 and that only 6% of farm operators nationwide are under 35 years old. But can farming attract enough young people fast enough? For Nat and Alison Bjerke-Harvey, farming was a natural progressive career path, although it wasn’t their goal to start with. The couple met while working for Pastoral Artisan Cheese in Chicago. After finding their love for fermented dairy products (and each other), they had a desire to learn how to make cheese themselves, so they spent three seasons on Prairie Fruits Farm & Creamery in Champaign, Illinois. They found working on a farm was a lifestyle that suits them both. “I was surprised at how much I enjoyed the work. I’ve always liked working with my hands and have experience in organic vegetable farming, but I’d never done anything with dairy. After a while, our goal became to figure out how to do it on our own,” said 32-year-old Nat Bjerke-Harvey. “We like to be engaged in all aspects of any business we are involved in. A strong work ethic and self-awareness are both important personality traits for farmers,” added his 35-year-old wife, Alison. Once the couple knew they wanted to run a dairy/creamery, they knew what to look for in a farm. “We knew we wouldn’t want to milk more than 75-100 animals, so we’d need 30-40 acres of pasture for them. That means we’d need 60-80 acres total that offered a diversity of pasture and wooded land. We needed something we could live on, and we wanted to be close to a college town of 50,000-100,000 people that had a liberal, foodie demographic that would support local farmers markets. We also wanted to be within a two hour drive of a major metropolis for access to restaurants. Another factor was our future products. We couldn’t go somewhere were goat cheese is commonly produced. We wanted to be on the front end of that trend in our area,” said Nat. Alison’s parents found a 60-acre parcel of land just five miles away from their own house in Manhattan, Kansas that met Nat and Alison’s parameters. They bought the farm and hosted their wedding there in a meadow last October. Of course, being close to family is an added benefit. “Grandparents are free babysitters!” said Alison. Finding the land was just half of the battle. The National Young Farmers Coalition, which works to help young people trying to get into farming, lists available land and lack of capital as the largest obstacles to new farmers. But the Bjerke-Harveys were able to finance half of their mortgage through the USDA’s Farm Service Agency, an organization that serves farmers and ranchers through effective and efficient agricultural programs. Through the FSA, the Bjerke-Harveys were able to secure a 1% interest rate, which made purchasing the property feasible for them. Nat works as a fromager, or cheesemonger, in a local restaurant running its cheese, charcuterie and pickling program as well as helping with menu development. He’s also a buyer at a local cheese shop. Alison is a baking instructor at the American Institute of Baking, which provides professional training in baking technology. Her full-time salary position provides the couples’ benefits and most of their income, and will continue to do so, until they are able to become self-sufficient on the farm, which is expected to take several years. “It’s already been a slower process than we expected, and we’re still working on a plan for the farm. We started last year growing vegetables to sell at local farmers markets. Adding laying hens allowed us to sell eggs, and adding more livestock is the next phase, which will actually help to manage the land. The dairy and creamery will come after,” said Nat. By starting small and establishing their brand in the local community (they are still deciding on the name of their farm), the Bjerke-Harveys believe their strategy will pay off because people will already be familiar with them as they begin to introduce new products. The Bjerke-Harveys already know the lifestyle they’ve chosen is hard work, as they both worked 15 hours a day from March to October, maintaining the farm while working their “off farm” jobs. They recommend that anyone interested getting into the farming industry should actually work on a farm, and not just for one year. “It can be really fun the first year, but the second year may present different challenges, so you want to make sure the lifestyle is for you,” said Nat.